Ardent Craft Ales is on a roll these days and its sure to increase with the weather getting nicer and their beautiful patio. Here are a few things you should try and check out. Head down to Station 2 tonight at 5pm as they tap a special cask conditioned pin of Sour Porter. This pin was created in the effort of duplicating a 150 year old recipe when porters were thought to be sour. Go out and try their collaboration with Triple Crossing on the patio starting at noon. Just go ahead and get your tickets for Swine & Brine already! Ardent’s first outdoor festival will feature The Roosevelt, Metzger Bar and Butchery, Saison and ZZQ cooking and grilling whole hogs, a slew of other pork cuts, and sides. Rappahannock River Oysters will also join the festivities with their delicious oysters (I’m hoping for some fried!) and crab cakes. King Of Pops – Richmond will be there with plenty of desserts to help cool down your Friday afternoon. 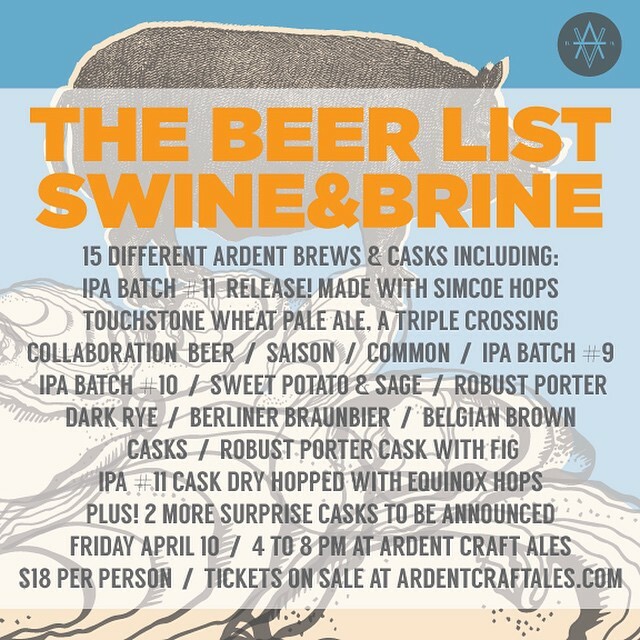 Tickets are $18/person and include two tickets redeemable for food or beer as well as a Swine & Brine t-shirt. All beers and food items will cost one ticket ($5) with the exception of crab cakes from Rappahannock (2 tickets) and King of Pops who will accept cash or credit cards. Guests will be given two tickets as part of their admission, and can purchase additional tickets via cash or credit card at check-in or once inside the event. Free water will be provided at stations around the festival. If all of this hasn’t gotten you excited, then maybe this list of fifteen beers will. Go ahead get your tickets here.